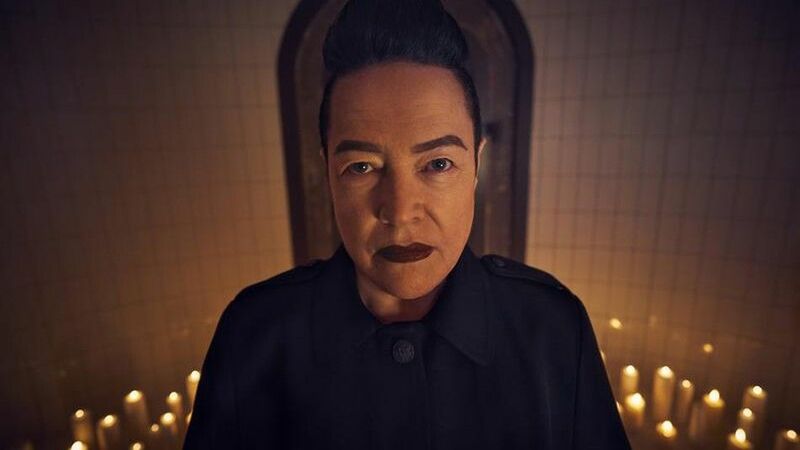 Is Kathy Bates’s Ms. Mead a Robot on ‘American Horror Story: Apocalypse’? American Horror Story loves to throw curveballs at fans, and Season 8’s Apocalypse is no different. In the past there have been sadistic nuns, killer clowns and vampires, and now there’s a new terror added to the anthology series: robots. Or at least that’s what it seems like. On Wednesday’s episode, Ms. Miriam Mead (Kathy Bates) was behaving as usual, taking care of her postapocalypse crony work for Sarah Paulson’s Ms. Wilhelmina Venable in Outpost 3. That is, until she caught genetic prodigies Timothy Campbell (Kyle Allen) and Emily (Ashley Santos) breaking the fornication rules set by the Cooperative. “We warned you. You brought this on yourselves,” she tells them. Mead orders them to be executed by two guards in the decontamination chamber, but Timothy fights back. He punches one of the guards, gets his gun and shoots Mead in the belly. She stumbles into another room and looks at the damage. Mead grasps her gut, which shows a milky-white fluid and broken wires. It’s like a scene out of HBO’s Westworld, where robots try to take over. Mead looks shocked that she isn’t bleeding blood. Before the wound, she seemed human enough. She had plenty of sexual tension with Ms. Venable, and a back story about how her father was in the military. As with Westworld, this could have been programmed. There are plenty of questions that this raises. Did Mead know she was a robot? Did the Cooperative know she was an automaton? Langdon seems to know everything, so he probably knew. One thing he wasn’t OK with was Ms. Venable’s interpretation of the rules. While she and Mead are against any form of sexual interaction, he claims she took some latitude with procedures. “I’m onto you. You’ve created your own rules in here,” he said to Venable, not revealing his true identity. “American Horror Story: Apocalypse” airs on FX on Wednesday nights at 10 p.m. ET. What Happens on Halloween Night in 'AHS'?